The increasing demand and competition for secondary school places in Kenya has made it difficult for students from low-income families to secure places. Luckily, several organizations offer scholarships to students who get good grades in KCPE. Below is a list of the top ten secondary school scholarships in Kenya. Co-operative Bank Foundation runs an educational scholarship scheme for academically talented and less fortunate children, who are finding paying fees for secondary school a challenge. The goal of this scheme is to provide children from disadvantaged backgrounds the opportunity to access education. Through this scholarship program, the foundation identifies needy students, sources mentors for them and nurtures their leadership skills with the aim of making them agents of positive change in the society. The Palmhouse Foundation gives scholarship opportunities to bright, talented children from financially disadvantaged families. Students whose families face financial challenges, as well as those from poorly equipped rural primary schools are the focus of this scholarship. Palmhouse Foundation is committed to financing secondary education for children from all over Kenya. Through this initiative, this foundation intends to transform the recipients’ lives, as well as their families and the society around them. In 2011, Equity Bank launched the Wings to Fly scholarships, with the support of the MasterCard Foundation. This scholarship program aims to grant over 10,000 comprehensive secondary school scholarships in Kenya, targeting academically gifted and financially and socially marginalized young Kenyans. Recipients benefit from leadership training, skill development and networks from within the bank that help them succeed in secondary school, university education and the workplace. In collaboration with several other partners, the KCDF has managed to increase the number of girls who transit to higher levels of education through the provision of educational scholarships. The program also focuses on teaching the girls life skills to help them cope in the marketplace. Kenyan girls from disadvantaged backgrounds get the opportunity to acquire life skills, quality education, financial support and work readiness exposure. KCDF aims to assist Kenyan girls to beat the cycle of poverty and empowers them to give back to their communities. The Hilde Back Education Fund is a Kenyan charitable organization that focuses on assisting children from poor backgrounds to complete their secondary school education. This organization focuses on the provision of education as a basic human right. Scholarships are open to students from all walks of life, regardless of their race, ethnicity, religion, or gender. This scholarship program is run by a Canadian not-for-profit organization, which has no government or religious affiliations. HYTES raises funds in Canada to finance scholarships in developing nations. The current focus of HYTES is paying secondary tuition costs for students who are both community-minded and financially challenged in Kenya, Zambia, Guatemala, and Tanzania. The Elimu Scholarship Fund seeks contributions from groups, corporations, foundations, and individuals to provide access to education for intelligent children in Kenya. This charitable organization provides hope and opportunities for education to bright children who have limited financial capabilities. Orphans who display academic prowess but lack funds to pursue their education are also welcome to apply for this scholarship. To qualify for this scholarship, the student must have received admission to a private or public secondary school recognized by the Ministry of Education. The scholarship covers 100% of school costs and includes a stipend for the recipient. “If you educate one girl, you educate a society” is one of the slogans this initiative goes by. This society sources scholarship funds for female students who meet the necessary academic standards for secondary education. CHES seeks to improve the quality of life for women in Kenya by providing scholarships for young girls who are unable to raise school fees. The Akili Dada initiative seeks to empower the next generation of African women leaders through the provision of access to high-quality education, rigorous leadership development and personalized mentoring. Bright, promising young women benefit from high-quality secondary school education at either of Akili Dada’s partner schools. The Kenya program is the latest initiative started by Africa Educational Trust. This trust specializes in reaching remote and excluded communities, and as such, expanding into Kenya was a logical extension of its work. A partnership with the Leigh Day law firm to help support schooling for vulnerable children in Laikipia North provided the trust with the opportunity to better understand the educational needs of the communities in this region, and in particular the local Maasai community who have lost their traditional pastoralist livelihood and yet still remain isolated from education and opportunity. In 2014, the first major program to support Maasai children was started. This program has the local children studying in their local language at first, after which they are prepared to begin studies in English. 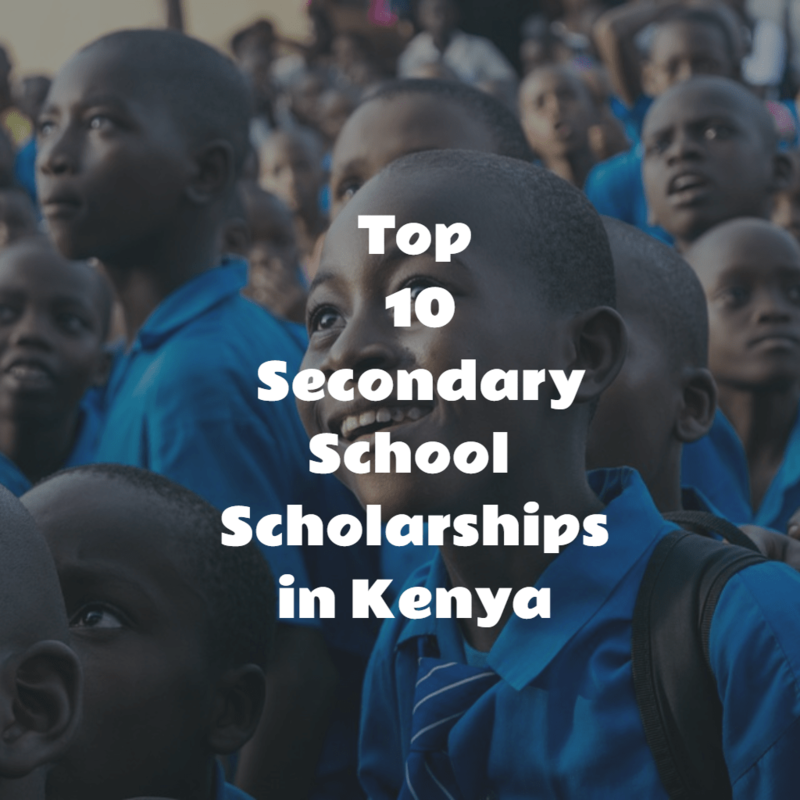 Above are ten of the most popular secondary school scholarships in Kenya today. If you have, or know of a needy student, encourage them to apply for these opportunities.